After customizing a slideshow, you have several ways to share it. You can play it on iPhone / iPod, stream the slideshow to HDTV, save it to Camera Roll, even upload to YouTube / Facebook / Dropbox / SkyDrive for sharing. Tap the Export tab and choose where to share the slideshow from sharing options list. Touch Photo Library from output option list, enter title/description for the slideshow video and choose video resolution from 360p, 540p and 720p. 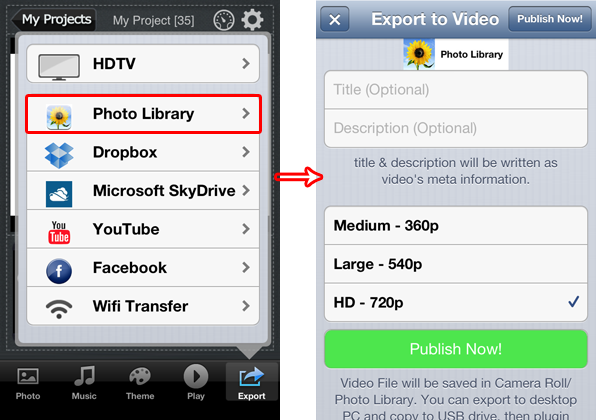 Then touch Publish Now, the app will begin to encode and save the photo slideshow to iPhone / iPod Camera Roll. 11.3 Post a video slideshow to Facebook, YouTube, Dropbox and Skydrive. Touch Facebook / YouTube / Dropbox / SkyDrive option from output options list, enter your accont information and sign in. Let's take how to post a slideshow to Drobox as an example: 1. Tap Export tab and choose Dropbox. 2. Sign in your Dropbox. 3. 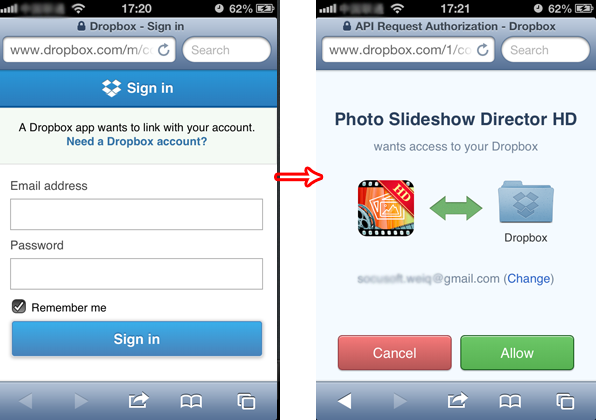 In the API Request Authorization window, tap Allow button to enable the app to access to your Dropbox. 4. In the Upload Video window, type title and description for the video slideshow , choose a video resolution, then tap Upload Now! to post the slideshow to Dropbox. 11.4 Wireless transfer a slideshow video to computer. To transfer a slideshow to PC via WiFi, you need to save it to iPhone / iPod Camera Roll first( read 11.1 above). Then follow the instructions below. Touch Wifi Transfer option from output options list, then a Wifi Transfer window will show up with tips on using WiFi transfer feature. Enter the URL into your PC browser, the slideshow will be lised on the browser, click to download it to your computer. Note: To use the Wifi transfer feature, please make sure your computer and iPad are using the same internet.